Jeremy Corbyn has twice refused to rule out revoking Article 50 and cancelling Brexit if he became prime minister. The Labour leader was meeting European Commission chiefs in Brussels yesterday. He vowed to prevent a no-deal Brexit after holding "constructive" talks with Michel Barnier, the EU's chief negotiator, and Martin Selmayr, the commission secretary-general in Brussels. Asked directly on two occasions whether that would include supporting moves for a lengthier extension to allow for another referendum or to cancel Brexit outright, Mr Corbyn would say only: "These are hypotheticals." Later on the same day, at a summit in the Belgian capital, Theresa May asked the EU27 heads of state and government for a short Brexit extension. Donald Tusk, the president of the European Council, said on Wednesday that the EU would grant a short extension if MPs passed the deal. "Our determination is to prevent a no-deal exit from the European Union next Friday," Mr Corbyn told reporters. "The problem is that the prime minister seems to think that she can run down the clock by constantly threatening the British parliament with a no-deal exit unless they support her deal." A Labour spokesman later said the party respected "the result of the referendum". "We do not believe that revoking Article 50 is in any way necessary," he said. A European Court of Justice ruling found Britain had the right to unilaterally revoke Article 50 without the EU's permission. It would retain all its rights and opt-outs, including the EU budget rebate. In contrast, the request to extend the Article 50 period, which was meant to last two years, has to be unanimously approved by all 27 of the remaining EU member states. Standing outside the commission headquarters, Mr Corbyn claimed he was building a majority for an alternative Brexit approach in the Commons. 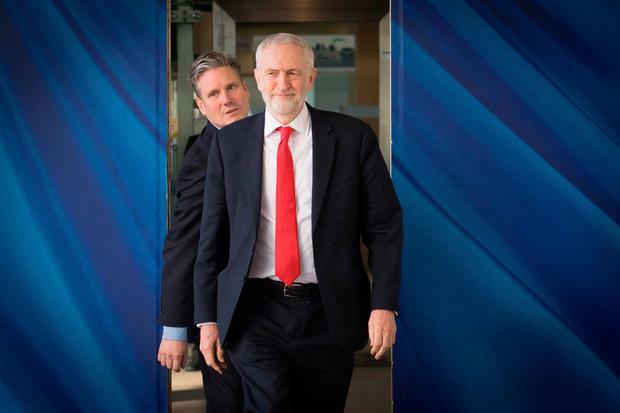 Accompanied by Keir Starmer, the shadow Brexit secretary, Mr Corbyn said Labour was "building a majority in parliament that can agree on a future constructive economic relationship with the European Union". "We've been discussing how this could come about and trying to reach out here as both Keir and myself have been reaching out to colleagues in all parties in the UK parliament," he said. "This morning's meetings have been positive and we have done what I believe the government ought to be doing - instead of bringing back a twice-rejected deal to the British parliament, looking for constructive solutions." EU sources said the meeting had been at Mr Corbyn's request and that Mr Barnier's "door was always open" to parties involved in the Brexit process. Labour backs remaining in a customs union with the European Union.